A lava flow threatens the Porters’ home. This episode's title was inspired by the 1990 Tom Hanks/Meg Ryan film Joe vs. the Volcano. When Tom gives the ball to Kevin by tossing it to him, he says, "Head's up, magic man." "Magic" is probably a reference to Earvin "Magic" Johnson, a well-known and extremely proficient professional basketball player for the Los Angeles Lakers from 1979-1991. 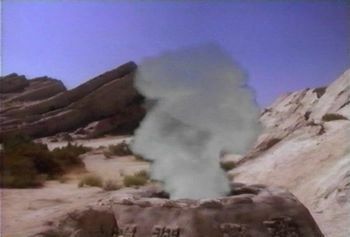 When Tom looks through his binoculars at 3:59 in the episode, we see a matte painting of an LOTL-ized version of Vasquez Rocks, where the desert scenes of LOTL90 were filmed. 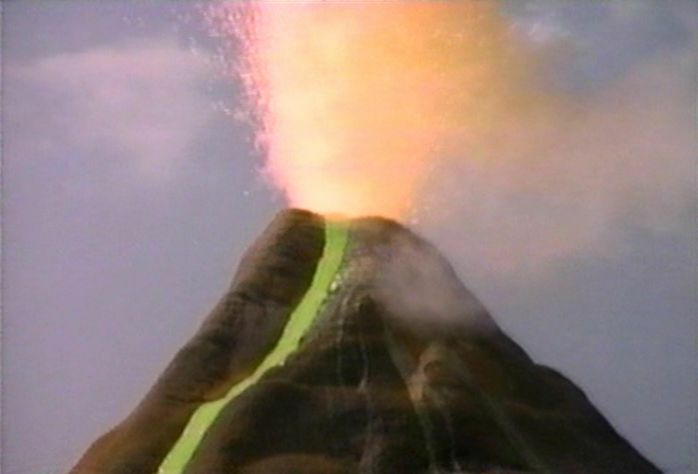 At 9:22 in the episode, Kevin is narrating his video of the erupting volcano and he comments that he is on a world "far, far, far away", an obvious allusion to the famous introductory quote of the Star Wars films. At 9:58 in the episode, as the camera zooms in on Tom and Christa standing on the cliff, something briefly pops in on the left-hand corner of the screen for a split-second; probably a microphone or other off-camera device. At 13:26 in the episode, as Annie is calling "Daddy!" in search of Tom, Stink is also shouting "Daddy!" A funny bit. When the giant crystal makes its final flare and then goes dark, we see smoke first rising out of the cone-shaped hole, then being sucked back down. Following this, we see the smoke and ash of the erupting volcano suddenly reverse and get sucked back in. Was the cave hole then deliberately designed to look similar to the volcano in order to identify its purpose (controlling the volcano)? But, if that's the case, why does the crystal burn itself out, literally disintegrating? Apparently, it could only be used once; unless it's just that its age caused a fatal malfunction. At 21:10 in the episode, Stink must be deliberately trying to get a laugh out the humans. He is covering his ears as if he thinks the giant crystal is still shrieking, but we saw in the previous scene that he knows it has stopped. Anyway, it works...he gets a laugh from the gathered yumani! 1:48 Stink says, "Pelicayo! Pelicayo!" "Lava! Lava!" Why is the lava green? Rather than actual lava, could it possibly be a method used by the underground Sleestak civilization to eject treated waste materials from their realm? When Kevin touches the giant Sleestak crystal, the blue glow of it intensifies. Does this signify that it was designed to be used by touch? Perhaps the being touching it could focus his thoughts through it to make things happen? This would make it something like a large scale version of Shung's power crystal dagger. Why does this crystal glow blue and Shung's crystal dagger glow green? When Kevin tries to scale the cave wall to escape the crystal chamber, the crystal glows bright again and pulls him down with an unseen force. Why? Is the crystal an artificial intelligence that desires companionship after its abandonment by the Sleestak civilization? In the earlier episode "Jungle Girl", Stink looks up at a hole in the ceiling in one chamber of his and Christa's cave home. The hole looks similar, though more irregular, to the one seen in the ceiling of the crystal chamber here. Might the hole in Christa and Stink's cave indicate that their cave was formerly a Sleestak crystal chamber similar to the one seen here? If this is the case, what happened to the crystal pillar in their cave? Did it disintegrate at some point like the one in this episode?